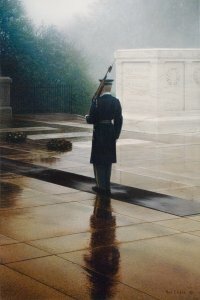 The Tomb of the Unknown Soldier is one of Arlington Cemetery's most popular sites. The Memorial Amphitheater has been the scene of funerals of some prominent Americans as well as the site of the Memorial Day and Veterans Day celebrations. The remains of unknown American soldiers from World Wars I and II and the Korean conflict are contained in the Tomb. It is perpetually guarded by members of the 3rd United States Infantry (The Old Guard). Since 1937, the Tomb has been guarded 365 days a year, every minute of the day and night. The guards never wear their rank on their uniforms, as they do not want to outrank the unknown soldiers, whatever their rank may have been.